Copyright �2011 PopEntertainment.com. All rights reserved. Posted: May 5, 2011. Inspired by in the very chilly Scandinavian country of Norway, the Marvel Comics-based Thor � with its roots in the legends of the Norse Gods and their fabled home of Asgard � puts a grand and glorious� verging on the absurd� spin on the pulp-ish superhero. Okay, putting a Nordic spin on director Kenneth Branagh's Thor, the latest cinematic rendering of a Marvel Comic character, might be pushing it � but this flick hits most of the grandiose marks and certainly won't dissuade the interest in anything mythic or even Shakespearean. As quality genre flicks go, this huge, effects-laden epic looks like it's worth the $150 million dollars that it cost. The film starts in 899 AD Norway, when the Gods, led by Odin (Anthony Hopkins), defeat the Frost Giants who have plaguing Midgard (Earth). The victory is won at a cost � Odin's eye � and the enemy is pushed back to their home world of Jotunheim. 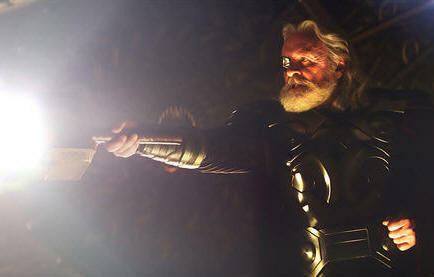 When several giants try to regain the Casket of Ancient Winters, the source of their power which had been seized by Odin, his hot-headed, arrogant elder son Thor (Chris Hemsworth) leads a band of fellow warriors to attack them, thus defying his father's will and abrogating the fragile peace. As a result, he's banished to Earth without his powers. Thor must now prove himself worthy in order to regain his hammer Mjolnir, his power, and then battle his evil brother Loki (Tom Hiddleston), who has betrayed Odin and the other Gods. Without going into the endless plot permutations, the Shakespearean-trained Branagh turns out to be an inspired choice to helm this tale, told with over-the-top theatrical excess and incredible effects. It also adds to the set up for the upcoming epic The Avengers. The recent Los Angeles press conference for the film � which included Hemsworth, Hopkins, Hiddleston, Kat Dennings (sidekick to scientist and love interest Natalie Portman), Idris Elba (who plays Asgard's stolid guard Heimdall) and Jaimie Alexander (who plays, Sif, one of Thor�s warrior allies) sat down to talk about Thor and turned out a few grand and glorious comments as documented below. Tom, is it true that you thought that Loki was the hero of the movie and that you wanted to be Thor? Tom Hiddleston: I think there are no villains in this world; there are just misunderstood heroes. Loki thinks he is the hero. There�s an aspect of Loki that is, essentially, that if you boil this film down to its barest elements, it�s about a father and two sons. Both of those sons are two brothers competing for the love and affection and pride of their father, Odin, played by Tony [Hopkins]. There�s just a deeply misguided intention within Loki. He has a kind of a damage within him. And he just goes about getting that pride in the wrong way. I didn�t actually want to be Thor, but my hair is in all sorts of trouble at the moment. I was born with very blonde, curly hair, not unlike Gene Wilder in Willy Wonka and the Chocolate Factory. I�m 6�2�. 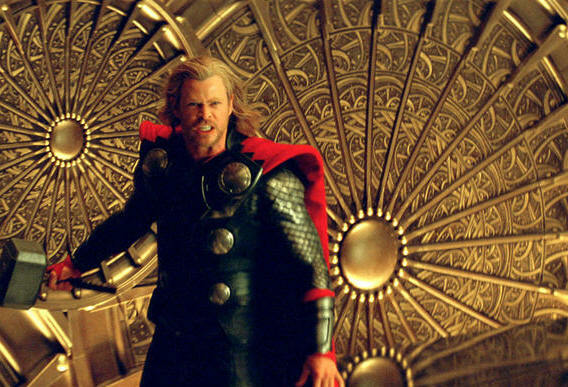 So like every other English-speaking actor over 6 foot who�s got blonde hair, I went up for the part of Thor. But I�m not built like a house, like [Chris]. And there�s no way in Odin�s Asgard I could have delivered what Chris has done. It was always meant to be this way, I think. We�re much happier as things are. Chris, what kind of hero do you think we need today? And what�s your favorite movie hero? Chris Hemsworth: Growing up, parents were my heroes� in the way they conducted their lives. My dad works in child protection, and he�s spent many years in that line of work. As kids, our experiences shape our opinions on ourselves, and the world around us, and that�s who we become as adults, because of that experience. So yeah, he�s certainly been my hero. In movies, the idea is of a heightened reality and the fantasy is that we�re able to be swept up in these larger-than-life heroes. And the possibility of someone much more powerful and greater than we are can come and save the day, which, so to speak, is inspiring. It�s the people who put themselves on the line and sacrifice their own safety for the greater good and for others. I think anyone in any sort of profession [in which] their concern is the welfare of other people instead of individual: that is inspiring and important. Growing up, I had a lot of different [heroes from] films. Superman was probably the very first one I was aware of, and I would run around the house pretending to be him, at some stage when I was a kid. I also had a Robin costume, Batman�s sidekick, which a nice pair of green underwear and a yellow shirt and red cape. I was about six or seven. I love Han Solo too. Could you talk about the most miserable things you did to actually get that kind of physique? Chris Hemsworth: The most uncomfortable thing was the eating. I didn�t mind so much the working out. I�d never really lifted weights to that capacity beforehand, and it was certainly a whole new sort of education, for a good six months. I just don�t naturally sit at that weight, so I had to force feed myself with 20 chicken breasts and rice and steak and all very boring to the plain things. That was the most exhausting part, I think, out of the whole film; [it] was the eating. It wasn�t the fun stuff, either. It wasn�t hamburgers and pizza and what have you. For Sir Anthony Hopkins, what drew you to be a part of this comic-book movie? 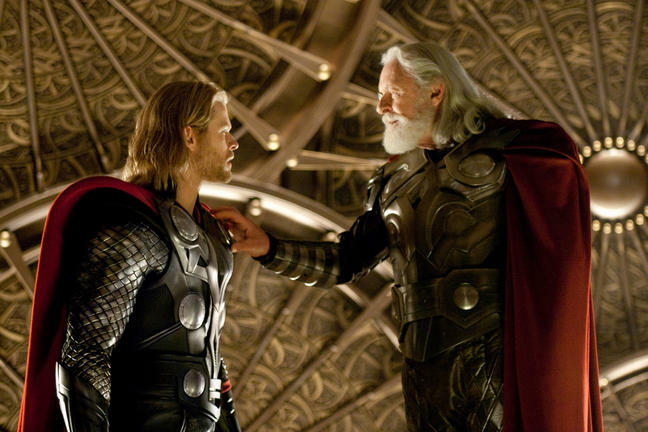 Was it a chance to work with Thor director Kenneth Branagh, or was it the material itself? The funny thing was, I hadn�t seen Ken for some years, and wasn�t sure how he would respond to me, because I was one of the bad boys who ran away from England many years ago, and I came out to Cuckoo Land out here. I never fit into British theater and all that. So I wasn�t sure how he�d receive me. But we met at the breakfast down in Santa Monica. He was very pleasant and friendly, and we had a chat about old times and all that. He said, �Would you like to play Odin?� I said, �Yeah, okay.� He gave me the script and I read it. I thought, �Yeah, I�d love to work with him,� because I�ve always been a fan of Ken�s, actually. I�m not a geek, but I read Captain Marvel as a kid, and that�s all. It turned out that [Thor] was the most enjoyable film I�ve been involved in for a long time, principally because of the cast here, and Chris and Tom and everyone. And Ken. I�d gone through a patch where I was getting very indifferent to everything, and I could care less about anything. Then to work with Ken, he just pushed the right buttons to get me to give of my best. I really value that in him, because I�d gotten lazy. He�s one of the best directors I�ve worked with, and so that was the principle reason. And hey, I wanted the work. Gotta pay the rent, you know? I thought this was a nice part. Didn�t have to do too much. The only thing was, I wish I�d gone down to New Mexico, because I had such a good time in the studios. My time was so brief. I think I was only on it about three weeks, on those great sets and everything. And then, no acting required. I wrote in my script, NAR � no acting required, let the armor act for me on the sets. So I let the armor do it for it, and the beard, and that was about it. And showed up and put on my voice and that was about it, but I really enjoyed it. 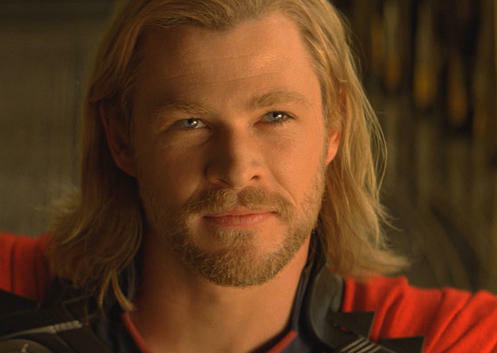 Chris, the physical demands of the role aside, how did you as an actor approach the mighty role of Thor? Did you look into the 600-plus issues of the comics, or did you pay more attention to the actual Norse mythology, or did you find a way to combine both? What was important to you when taking on this role? Chris Hemsworth: I started with the comic books, but I didn�t read all, however many of them there are. There are thousands of them, 40 or 50 years� worth. 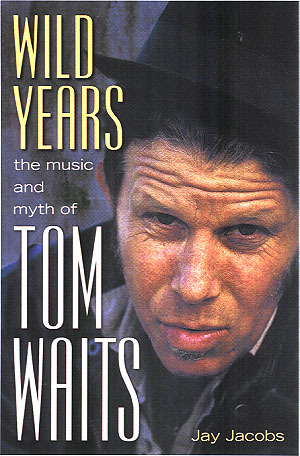 But I certainly read enough to get a sense of who he was and the world he was from. I read some things on Norse mythology and this sort of fatalistic view they have that everything�s pre-ordained, and that leads the Vikings into this fearless sort of attitude in battle and with their lives. They certainly back their opinions, I think. And they�re not swayed easily. That spoke volumes to me about the character. You fill your head with whatever information and research you have, but on set, it was just about making it truthful and finding a way. A simpler way that I could relate to it, instead of thinking, �How do I play a powerful god?� It became about, as Tom said, scenes between fathers and sons and brothers. You personalize that and that helps ground the story for an audience. Then we can relate to it and hopefully an audience can, too. Kat, your character had the largest comedic role throughout the film. Did you enjoy it in such a serious superhero film? 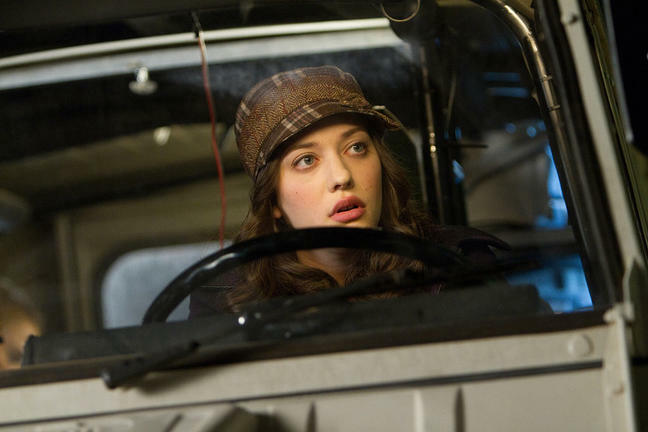 Kat Dennings: I saw the film a week ago, and hadn�t seen any of the Asgard stuff. I know when you got to our parts in Santa Fe, you felt like you were on a different film. It�s a totally different thing. So it didn�t feel like, �Oh, I feel like I don�t belong anywhere.� It kind of felt like he didn�t belong, which is why it�s hilarious. Natalie and I have been friends for years anyway. So it was actually pretty easy. We just hung out and goofed off and were girls. And poor Stellan [Skarsg�rd] had to listen to us talk about boys and nail polish. So it was pretty easy. For the actors who played as Guardians, it was more challenging or more fun to wrap your mouth and your mind around the film�s mock heroic middle English? As a follow-up for Idris, how much of a pleasure was it to not have to do a fake American accent? Idris Elba: One of the challenges for the script and the story and now the audience is that you have these two huge worlds, but they�re equally as well-thought-out, well-written. Kenneth, he wanted us to all have a sort of uniform sound, if you like. You know what I mean? Even though, you do say mock English, but it was set in that world, but exactly not English, which is what I was told. And yeah, fake American accents? Wah, wah, wah. Try some Asgard, you know what I mean? Jaimie Alexander: I had a good time. I don�t know. It was fun learning the accent and training for the film and goofing off with these buttheads to my right. Yeah, we all trained together, prior to shooting. It made for a good time. Sir Tony had mentioned kind of facetiously that the costume really does the work for you. How does the wardrobe inform your character, in terms of creating and becoming that person? Tom Hiddleston: The costumes are incredibly heavy. If you got up in the morning and wear a pair of shorts, T-shirt and some flip-flops, it�s a signal that you might be going to the beach. If you get up in the morning and wear a breast plate, back plate, cape, and a pair of golden satanic horns on your head, it�s quite clear that you�re doing something else. We were so helped by, not just the costumes, but the beautiful sets built by Bo Welch, the production designer. You�ve got no furniture to lean on, really, and no props to busy your performance. There has to be a kind of simplicity, too. The costumes make you stand straighter. It�s like being in a neo-classical museum, and if you go up to the Getty, you have a sense of the size of the place, and that just does stuff to the way you stand. 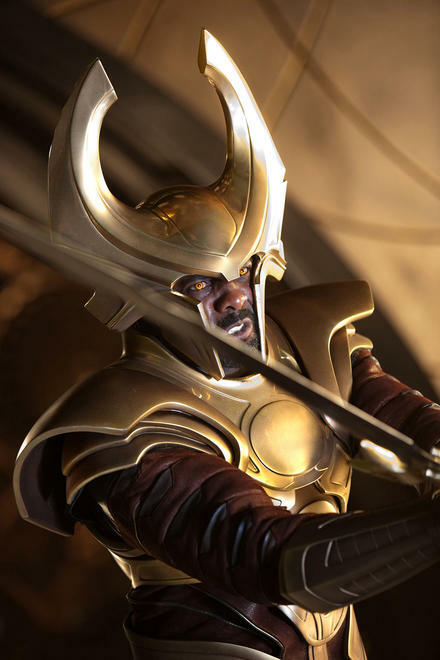 Idris Elba: With Kenneth, one of his biggest notes for me was just let the costume do it, because I had this huge helmet on my head and could hardly see. Kenneth would just say, �Don�t worry. Just live in it, and stay as still as you can; let the costume and the opulence � do the work.� And the script, of course. So Tony, did you get to pick your eye patch? Anthony Hopkins: I can�t remember. They put it on the wrong eye, first of all. And I said, �I think you made this for the wrong eye.� They said, �Yeah, we did.� But they had another [one] put in that eye. The only problem with that was moments of anxiety because I had no three-dimensional vision. I felt like an old � Well, I�m not that young anymore, but to be guided onto the set, I felt very embarrassed. �This way.� Because I couldn�t see. It was the thing would come off very quickly. But it was a costume and helped and all that. You don�t have to do too much, except speak up, I guess. But you don�t have to act. It�s like John Wayne said, �When you�re in the desert, he doesn�t have to act. You let the desert do it for you.� Those movie actors of that time, they knew what they were doing. They just got on their horses and did it and were wonderful. So I take a page out of their copy book and try not to do too much. With something like that, he knows so much. That�s the most comforting thing. You don�t have to work. You just do what he tells you. I know that sounds pretty wimpy to do that, but why not? He knows what he wants. A good director knows what he wants, and what it�s going to look like. Sir Tony, much has been made of Kenneth Branagh�s comments about how Shakespearean he saw the mythology and story of Thor. Is that putting too much weight onto what�s essentially a comic-book story? Anthony Hopkins: No, I don�t think so. I don�t trouble my little brain with that stuff, because I don�t think about too much anything anyway when I go on a film set because you can analyze and analyze. I leave that to the boss, the director. They decide what it�s going to be like, and you just follow. I�m not trying to demean my role in it, but you follow certain guidelines, and if you�re working with a director like [Steven] Spielberg, Clint Eastwood or Ken Branagh or [Martin] Scorsese, you follow the guidelines of what their style is. And he mentioned Shakespeare quite a lot. In the readings beforehand � we had about a week�s readings down in Manhattan Beach � we talked, not extensively, but a bit about the good old Westerns. Shane was one of my favorite all-time Westerns, when the bad guys come in and they have a conference and they try to negotiate. Jack Palance looks sinister and all that. To have that sort of feeling of big with the autocratic father and the troublesome sons. There�s a wonderful film called Lawman which Ken and I talked about, with Burt Lancaster � a great movie about rival factions. There�s the father, played by Lee J. Cobb, and all these bad sons he�s got. And there�s always one son who�s a little in the middle, not quite sure where he belongs. So we have those points of reference. On the horse when I [as Odin] meet my enemy and I say, �Let�s talk about this. We don�t need any bloodshed.� That was taken from an idea of a Western negotiation. I love those points of reference because I was a fan of all those early Western movies, Gary Cooper and all those guys. But Shakespeare, yeah. When you were first asked about working with Branagh, you said, �I was lazy, and Ken pushed my buttons.� What buttons did he push, and did he know you were lazy? Anthony Hopkins: Maybe I�m overstating it, but we�d come from the background that I�m 20 years older than Ken, and didn�t know him that well. But we had all the same reference points of the theater. We knew about the actors we�d been working with over the years. And we were both pretty rebellious � I know he was. I was rebellious in the fact that I was a bad boy. I escaped from England and the group theater and came over to America to Disneyland. I know I sold out. It�s nice. I�m glad I�ve sold out. So I wasn�t sure how he�d respond to me. But he�s just as bad as I am. He�s a rebel, and he�s challenged himself over the years. He did some extraordinary things 30 years ago when he was taking on people like Lawrence Olivier, doing Hamlet and Henry V, Much Ado About Nothing � a colossal background. His education is pretty profound. I read a lot but I hate taxing my mind with analysis. I�m not a good analyst. I cannot talk about acting. I hate talking about it. And I hate talking about analyzing. They always say, �Let�s talk about the�� Why? I�ve sat in conferences where you just fall asleep because it�s so boring. I don�t know, you just get up and do it. Get up and do the damned thing, instead of talking about it. And Ken is like that. He just says, �Do it.� I like that. I get too much the other way, of being Mr. Cool, not analyzing at all. Just walk blindly on the set. What Ken does is just say, �Come on, you can do more than that,� because I�d like to just be a little restrained. And he said, �No, let�s push it even more.� And it was a welcome invitation. That�s basically my story. Are we going continue to see Loki as that kind of a character in The Avengers movie, or is it gonna be a little more diametrical? 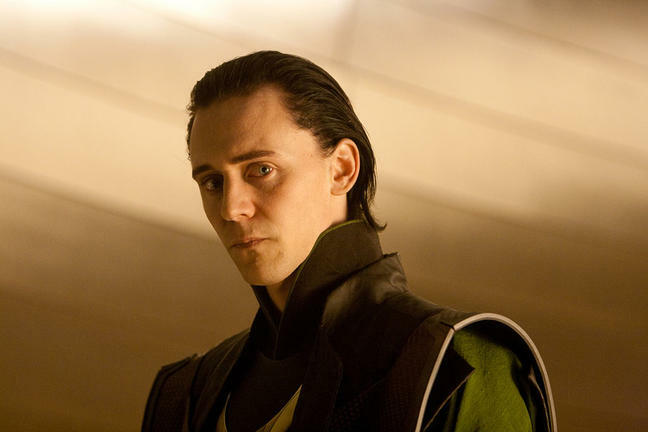 Tom Hiddleston: I took the character that I saw in the comics. Loki is a master of magic. He is, in the Marvel universe, the agent of chaos. Hs superpower is his intelligence, if you like. He�s a shape-shifter. It�s his ability to stay ten steps ahead of everybody else. So absolutely, Ken, Chris, Tony and I all talked about having those layers in a way that he�s someone with a fierce intelligence, but also a very damaged heart. I think a red dot will form on my forehead if I give any more information about Loki and The Avengers. All I can tell you is that Loki will be in The Avengers. It�ll take more than the man to my right [Hemsworth] to stop me this time. 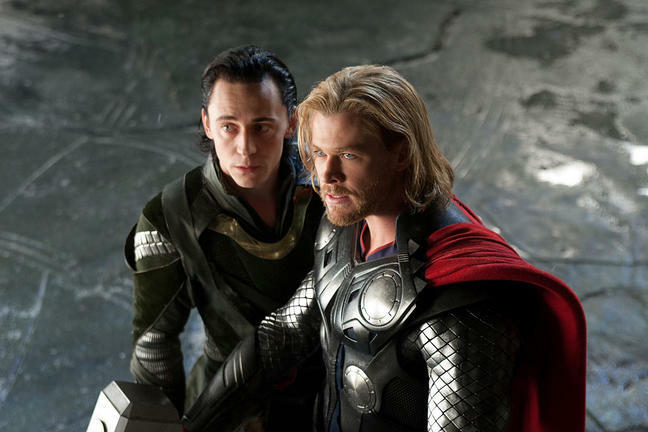 Chris and Tom � regarding The Avengers � you guys play very larger-than-life roles in this film. You�re going into a movie with four or five other larger-than-life characters. What�s the biggest challenge that you see in combining all these archetype heroes and villains into this one film? Tom Hiddleston: The sort of the thing that looks like a challenge is actually the reason it�ll work, as in, �How can one movie contain so many different flavors, colors and characters?� I think [The Avengers writer/director] Joss Whedon has probably made that his strength. And the conflict between each of them will be something that will be expanded on, I think. [says to Hemsworth] Wouldn't you say that? Chris Hemsworth: Yeah, sure. We don�t balance all the other characters, I guess. That�s just the writer and Joss, who�s the writer/director, his job is to navigate that. And like Tony was saying, we come in and do our bit. That�s all you can really concern yourself with. It�ll be an interesting combination. As Tom said, why it will work is that conflict in those larger-than-life characters and egos clashing. There�ll be some great tension there. Since we now know that Tom secretly wants to be Thor, is there another character in the Marvel canon that anybody would like to take on? 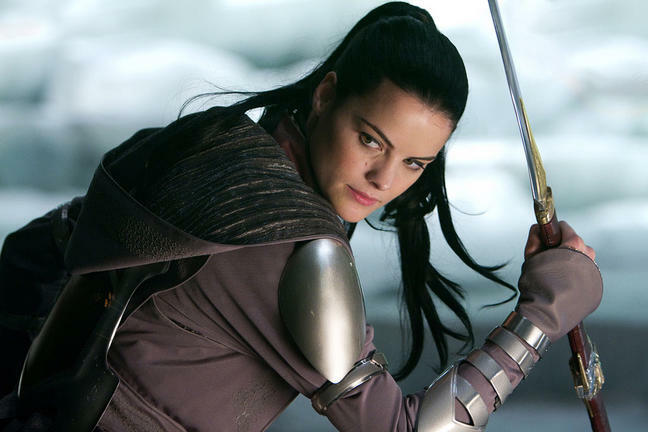 Jaimie Alexander: Oh, I have one: X-23. Yeah. Chris Hemsworth: Loki. Keep the horn in the family. Tom Hiddleston: The horns are all yours, man. Idris Elba: I�d like a stab at Luke Cage at some point. Anthony Hopkins: My one regret was that I didn�t go to New Mexico. I was going to suggest to Ken that I could play Odin�s twin brother, who actually goes down and is a sort of Fifth Columnist movement. So I wanted to be in New Mexico. No, I�m very happy having done Odin. I don�t know if I come back to another one. I don�t know if there�s a talk of that. 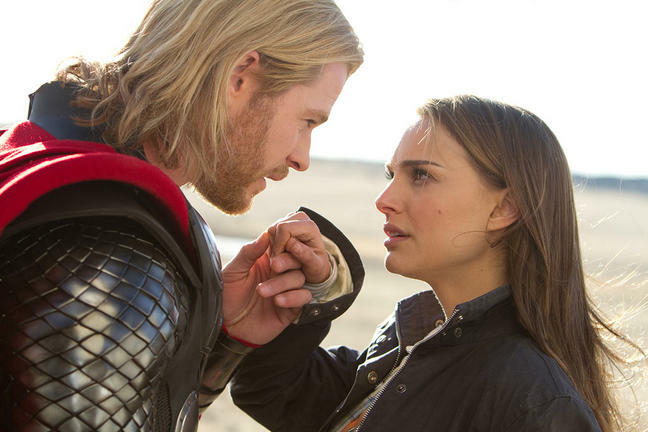 But I�d love to another one [Thor movie]. It was so unexpected to be in a movie like this. I like the unexpected. Living in a state of total non-expectation, it�s just a surprise what happens to you. All kinds of things come your way. When you have expectations, that�s when it�s disappointing. So to be in this was just a bonus, the gravy train, for me, because I�ve been around a long, long time now. So whatever comes along, I�m very happy to do it, if it�s a good script, a good director and good actors. I�m just very fortunate to mosey along and do what I do. But I mustn�t get too lazy. I need another Ken Branagh, because it�s very hard to find a director of that kind of power and gentleness. He�s a gentleman and that�s it. Kat Dennings: It�d be cool to see Darcy become something else, or to go up to Asgard, that�d be pretty amazing� I didn�t have expectations. I got this role, and then got to read the script. I didn�t read the script before I got this [role]. I didn�t now who Darcy was. Darcy�s not in the comics, so she became bigger through the rehearsals. I�m just thrilled that she�s still in it. I can�t believe I didn�t get cut. Chris and Tom, could you talk a little bit about the dynamic between you as actors vying for the attention of Sir Anthony Hopkins � as well as the brotherly dynamic that went from brotherhood to rivalry? Chris Hemsworth: I nearly caught Tom talking about having breakfast with Tony at one point. I said, �What? He�s having breakfast and I�m not?� [He laughs.] Tony, actually you said it, that it�s much easier to hate someone on screen if you actually like them off screen. It�s just a more enjoyable ride and this is nothing sort of personal about it. We got along and came into this at the same point in our careers, with the same enthusiasm, love for these types of films and just had a great time doing it. You either have chemistry with someone or you don�t. Thankfully, I think it was there. So to play brothers was easy and fun. Chris Hemsworth: That�s not true. You�re ruining my career right there. Chris Hemsworth: I have no idea what I was talking about. [He laughs.] Yeah. But in terms of vying for the attention of Tony, Tony was amazing. Anthony Hopkins: She said, �May I talk to your mom?� And I said, �Yeah.� She says, �Don�t act; you don�t need to act. Watch Spencer Tracy.� I said, �Oh, okay.� It was good advice. Anthony Hopkins: It would be terrible if you had met somebody who didn�t have a sense of humor. Anthony Hopkins: I remember this story briefly. My first film was The Lion in Winter and we had a couple of sound engineers. I was a new actor and there were there of us; we were three new actors on the block. This guy called Tom Buchanan, who was the sound engineer, walked behind me with his sound mixer. He said, �I hate actors.� But he did it to tease us. He�d be sitting there with the headphones on, and I�d be doing a scene. And he�d go, �What?� That humor gets you, sort of up, because you have to have humor. If you don�t have humor and you take yourself seriously, you�re dead in the water. You�ve got to have a laugh. Because it�s better than working for a living, isn�t it? Chris Hemsworth: Absolutely. That�s the thing I learned from Tony: Have a good time doing it, the appreciation for it and having fun. What should have been the most intimidating experience walking in was the most enjoyable. CLICK HERE TO SEE WHAT ANTHONY HOPKINS HAD TO SAY TO US IN 2006! CLICK HERE TO SEE WHAT IDRIS ELBA HAD TO SAY TO US IN 2013! #1 � 2011. Courtesy of Paramount Pictures. All rights reserved. #2 � 2011. Courtesy of Paramount Pictures. All rights reserved. #3 � 2011. Courtesy of Paramount Pictures. All rights reserved. #4 � 2011. Courtesy of Paramount Pictures. All rights reserved. #5 � 2011. Courtesy of Paramount Pictures. All rights reserved. #6 � 2011. Courtesy of Paramount Pictures. All rights reserved. #7 � 2011. Courtesy of Paramount Pictures. All rights reserved. #8 � 2011. Courtesy of Paramount Pictures. All rights reserved. #9 � 2011. Courtesy of Paramount Pictures. All rights reserved. #10 � 2011. Courtesy of Paramount Pictures. All rights reserved.